Objective: The aim of this study was to review literature on the effects of herbal dentifrice compared to conventional dentifrice on plaque and gingival inflammation. Materials and Methods: MEDLINE, Cochrane Central Register of Controlled Trials, and major journals were explored for studies up to September 30, 2017. A comprehensive search was designed and the articles were independently screened for eligibility by two reviewers. Randomized controlled clinical trials, in which oral prophylaxis was undertaken before the intervention was introduced into the oral cavity using toothbrush were included. Where appropriate, a meta-analysis (MA) was performed and standardized mean differences (SMDs) were calculated. Results: Ten articles out of 1378 titles were found to meet the eligibility criteria. A MA showed that for plaque intervention the SMD was 2.14; 95% confidence interval (CI): 0.88–3.41, P = 0.0009; test for heterogeneity: P < 0.00001, I2 = 96% in favor of conventional dentifrice; and for gingival inflammation, the SMD was 1.37; 95% CI: 0.49–2.26, P = 0.002; test for heterogeneity: P < 0.00001, I2 = 94% which also was in favor of conventional dentifrice. Subgroup analysis for plaque intervention and gingival inflammation in case of long-term (more than 4 weeks and up to 6 months) and short-term effects (minimum of 4 weeks) of herbal dentifrice showed no difference when compared to conventional dentifrice. Conclusion: Currently, there is no high-quality evidence to support or abnegate the anti-plaque and anti-gingivitis effects of the herbal dentifrice. Gingivitis is the mildest form of periodontal disease and is elicited by the accumulation of plaque on the tooth and the soft-tissue adjoining the tooth. Accumulation of dental plaque has been identified as the primary cause of this disease. It is a reversible condition but when left untreated, gingivitis can progress to periodontitis, leading to loss of bone and connective tissue which is the most accepted cause of tooth loss in all walks of life globally. Good oral hygiene has a key role at improving and promoting one's oral health. Self-performed plaque removal can be achieved through brushing, flossing, and rinsing. Less than one-third population of developed nations is habitual to the usage of dentifrices as a major oral cleansing device., A wide range of dentifrices are commercially available. Recently, an ardent interest in naturally based products has increased. As a result of which, numerous natural agents have been integrated into dentifrices., Herbal compounds used in indigenous medicine are of growing interest in the field of dental disease prevention. Following a robust demand for herbal toothpaste by consumers, manufacturers have switched to natural toothpastes to avoid synthetic and artificial flavors that are commonly found in conventional toothpastes. The growing range of over-the-counter herbal-based dentifrices in the market, also suggests there is an increasing consumer demand for these products. Purchasers that use herbal products often believe that these products are safe in comparison to products that contain chemicals. Although evidence from one systematic review of aloe vera herbal dentifrices for plaque and gingival inflammation claims that herbal dentifrice is efficient in reducing plaque and gingivitis when compared to placebo or control. However, a systematic review of the evidence for any herbal dentifrice is currently lacking. Therefore, the aim of this review is to assemble and assess, in a systematic manner, the available data on the effects of herbal dentifrice compared to conventional dentifrice on plaque and gingivitis. Does herbal toothpaste, in randomized controlled clinical trials, have efficacy in preventing dental plaque and gingivitis in comparison to a conventional dentifrice when used by healthy participants? 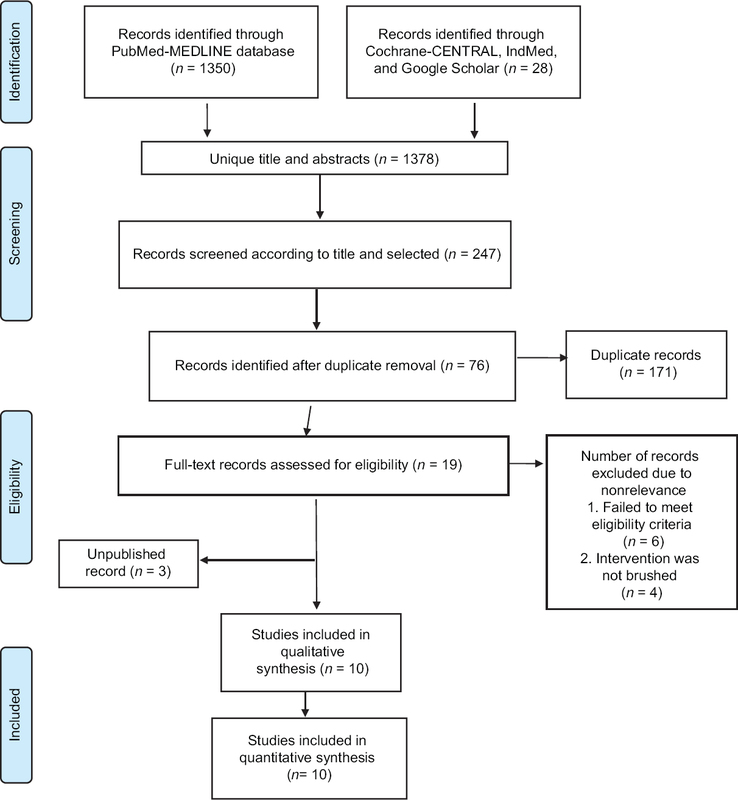 Two electronic databases were scrutinized for appropriate studies that would satisfy the study purpose: PubMed-MEDLINE and the Cochrane Central Register of Controlled Trials. Additional sources such as IndMed and major journals were explored from the earliest available date up to September 30, 2017 without restriction on language. Ongoing trial registries such as The National Institutes of Health Trials and Clinical Trial Registry India were searched. Contact with authors was done for any unpublished studies. Detailed search strategy is shown in [Figure 1]. Outcome parameters of interest: Plaque, gingivitis and bleeding. The papers were independently scanned by two reviewers (VM and SHS), first by the title and abstract. Case reports, letters, and narrative/historical reviews were not included in the search. If the search keywords were present in the title and or the abstract, the papers were selected for full-text reading. Papers without abstracts but with titles suggesting that they were related to the objectives of this review were also selected to screen the full text for eligibility. After selection, full-text papers were read in detail by two reviewers (VM and SHS). Those papers that fulfilled all of the selection criteria were processed for data extraction. 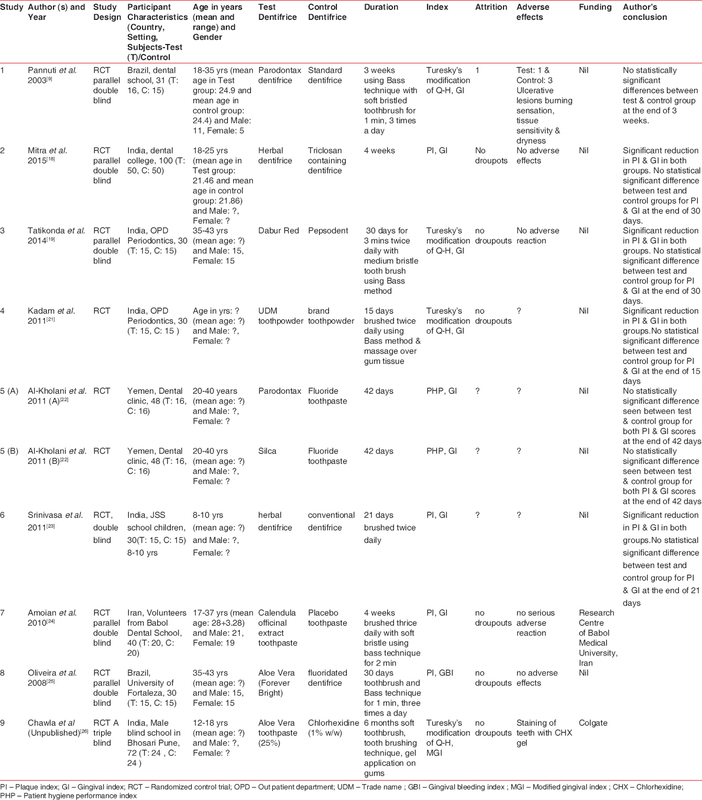 Two reviewers (VM and SHS) hand searched the reference lists of all selected studies for additional relevant articles. Disagreements between the two reviewers were resolved by discussion. If a disagreement persisted, the judgment of a third reviewer (PK) was considered decisive. Two reviewers (VM and SHS) independently assessed the risk of bias in each included trial using the Cochrane Collaboration's tool for assessing the risk of bias with any disagreement resolved by consensus. Data were extracted with respect to the effectiveness of herbal dentifrice when compared to conventional dentifrice from the assorted studies that met the inclusion criteria. Mean and standard deviations (SD) were extracted from the data (VM and SHS). When intermediate assessments were performed, the longest evaluation period was taken into consideration. For those articles that had inadequate data to be included in the MA, the corresponding authors were contacted for the procurement of additional data. Studies were categorized into plaque and gingivitis scores. However, the different indices for plaque and gingival inflammation measure the same concept but on different scales, with high correlation between them. Primary outcome variables from each study were combined for continuous data using a random effects model. A few of the studies had multiple treatment arms. Thus, if the data from the control group was used in more than one comparison, the additional treatment arm was used. The values and results of each study were represented separately. The basis of MA was the difference in means and SD of dentifrice on plaque and gingivitis. The data for the primary outcome was summarized as standardized mean differences (SMD) (95% confidence interval [CI]) for overall results by index and duration of outcome. Heterogeneity was tested by Chi-square test and I2 statistic. A Chi-squared test resulting in P < 0.1 was considered to indicate significant statistical heterogeneity. The analysis was performed using software (Review Manager, version 4.2 for Windows, The Nordic Cochrane Centre, The Cochrane Collaboration, Copenhagen, Denmark). The systematic review was registered with the International Prospective Register of Systematic Reviews on November 10, 2015 which was in accordance with the guidelines and was last revised on August 30, 2017 (Registration Number CRD42016037308). The PubMed-MEDLINE, Cochrane CENTRAL, IndMed, and other sources identified 1378 unique records which were screened by title and abstract [Figure 2]. After full-text reading, 10 records,,,,,,,,, were excluded. This exclusion resulted in 19 full-text articles plus 3 unpublished records. The remaining ten studies,,,,,,,,, that fulfilled the selection criteria were processed for data extraction. Additional hand searching of the reference lists of the selected studies yielded no additional records. An overview of the selected studies,,,,,,,,, and their characteristics are presented in [Table 1]. All studies were performed using parallel design. One study was triple masked, seven studies,,,,,, were double masked, whereas two studies, had no blinding. The study population in all the selected studies were patients with gingivitis. Six studies,,,,, were conducted in clinical setting consisting of adult population, whereas in two studies,, participants consisted of children and other two studies, dental students. Most of the patients selected in this review were educated to use either herbal or conventional dentifrice to brush their teeth twice daily. We have considered only herbal dentifrice versus conventional dentifrice in trials where more than one group was present. Out of 10 studies, Parodontax was used in three studies,, and Aloe Vera gel was used in three studies.,, In one study, two interventions were used which was compared with one conventional dentifrice. Manual toothbrushes were used in all studies. The use of any additional oral hygiene products was prohibited in most of the studies. Although two studies, performed gum massage and one study used dental floss. Most of the studies mentioned only verbal instructions. There was no mention of any supervision. Compliance in using the dentifrice was monitored in three studies,, when the dentifrices were issued and the patients returned after the trial. In another study, compliance was invigilated by the principal investigator after every 15 days. Funding was acknowledged in three studies, which comprised grants from one commercial (L. B. Aroma and Health Care, Mumbai, India) company; a grant from the Research Centre of Babol Medical University, Iran; and an educational grant (Colgate). The study funded by industry was affiliated with natural product. It was observed that, different indices were used, for plaque assessment such as Silness and Loe plaque index (PI), Quigley–Hein PI, Turesky modification of the Quigley and Hein PI, and Patient Hygiene Performance Index. Severity of gingivitis was determined using indices such as the gingival index, modified gingival index, and gingival bleeding index. Information regarding the study outcomes within the group is presented in [Table 2]. A significant change within the groups was observed in eight studies,,,,,,, of test dentifrice on all clinical parameters. [Table 2] presents a summary of the descriptive data regarding the significant differences between herbal and conventional dentifrice. In most of the studies, there was no statistically significant differences between the test and control groups except for two studies, which showed statistically significant changes. Adverse effects such as ulcerative lesions, burning sensation, tissue sensitivity, and dryness due to herbal and conventional dentifrice was noticed only in one trial. Five trials,,,, did not mention about adverse effects. In one study, staining of teeth was observed with chlorhexidine (CHX) gel. Rest of the trials did not show any serious adverse effects. A MA was performed for 10 studies with 11 comparisons to evaluate the efficacy of herbal dentifrice on the prevention of plaque and gingivitis as compared to conventional dentifrice. Difference in mean and SD values were calculated from the available data. Data from Al-Kholani was considered as separate studies with two interventions. Ten,,,,,,,,, studies with 11 comparisons showed that conventional dentifrice was better than herbal dentifrice with a 95% CI of SMD: 2.14 (0.88, 3.41); P = 0.0009; test for heterogeneity: P < 0.00001, I2 = 96% [Figure 3]. Ten,,,,,,,,, studies with 11 comparisons showed that conventional dentifrice was better than herbal dentifrice with a 95% CI of SMD: 1.37 (0.49, 2.26); P = 0.002; test for heterogeneity: P < 0.00001, I2 = 94% [Figure 3]. [Figure 4] illustrates the findings for the MA with a subgroup of long-term (more than 4 weeks and up to 6 months) and short-term (4 weeks) effects of dentifrice on plaque and gingival inflammation. Long term studies (SMD: 4.17; 95% CI: -0.17 to 8.50, P = 0.06; test heterogeneity: P<0.00001, I2 = 98%) for plaque showed no difference compared to conventional dentifrice and there was statistically significant difference seen for gingival inflammation (SMD: 1.61; 95% CI: 0.25 to 2.97, P = 0.02; test heterogeneity: P<0.00001, I2 = 93%). Results found for short term studies showing no difference between herbal dentifrice when compared to conventional dentifrice (SMD: 1.15; 95% CI: -1.10 to 3.40, P = 0.32; test heterogeneity: P<0.00001, I2 = 98%) and (SMD: 0.13; 95% CI: -1.64 to 1.91, P = 0.88; test heterogeneity: P<0.00001, I2 = 97%) for plaque scores and gingival inflammation respectively. [Figure 5] illustrates the findings of MA with a subgroup by type of control. Herbal dentifrice when compared to active agents such as triclosan and CHX (SMD: −0.07; 95% CI: −2.12–1.98, P = 0.94; test heterogeneity: P < 0.00001, I2 = 98%) and (SMD: −0.06; 95% CI: −1.02–0.90, P = 0.90; test heterogeneity: P < 0.00001, I2 = 91%) shows no difference between the two groups for plaque and gingival inflammation, respectively. MA with a subgroup of herbal dentifrice compared to conventional dentifrice (fluoridated or nonfluoridated) revealed that that efficacy of conventional dentifrice was significantly higher for plaque intervention (SMD: 7.34; 95% CI: 4.05–10.64, P = 0.0001; test for heterogeneity: P < 0. 00001, I2 = 97%), whereas there was no difference between herbal dentifrice when compared to conventional dentifrice for gingival inflammation (SMD: 1.48; 95% CI: −0.59–3.55, P = 0.16; test for heterogeneity: P < 0. 00001, I2 = 96%). Studies,, which consisted <4 weeks of follow-up period were eliminated in this analysis. The author's estimated risk of bias was low for 6 of the 10 articles, unclear for 2 studies, and high for 2 studies. Detailed information regarding the results of the quality assessment of the selected studies is provided in [Figure 6]. The MA results of low risk of bias studies showed that conventional dentifrice was significantly more efficacious for plaque intervention (SMD: 1.25; 95% CI: 0.08–2.42, P = 0.04; test for heterogeneity: P < 0.00001, I2 = 93%) but not for gingival inflammation (SMD: 0.73; 95% CI: −0.47–1.93, P = 0.23; test for heterogeneity: P < 0.00001, I2 = 94%). Random sequence generation, blinding of participants and personnel, and other bias showed more than 50% low risk of bias. Blinding of outcome assessment and incomplete outcome data showed more 75% low of risk of bias. No bias was seen for selective reporting. Allocation concealment showed 50% unclear risk of bias. Dentifrices are agents used along with a toothbrush to clean natural teeth, supplied in paste, gel, or powder form. Over time, there have been many dentifrices, several aiming at marketing strategies to sell products. The long-term effects of triclosan and stannous fluoride were confirmed and it was used as conventional dentifrice in comparison with herbal dentifrice.,, Considering that the dentifrices available presently in market are chemical based, costly, and have side effects, their use is restricted. The proved superiority of therapeutic agents efficacy was compared with a control based on earlier systematic reviews. Herbal dentifrices are available globally as “over-the-counter” oral hygiene products to help remove food debris and dental plaque. One would expect a consensus on which dentifrice to choose as there is an evidence that herbal dentifrice can be effective against dental plaque and gingivitis. The review included ten randomized control trials covering a total population of 229 which were eligible for the outcome measurement of gingivitis and dental plaque reduction in the MA. It was observed that the sample size was low. None of the studies have followed the proper sample size calculation for recruiting their study population. Low sample size can affect the outcome of the MA. Nonetheless, differences in the quality of the study designs, populations, percentage of dropouts, and reported loss to follow-up were revealed in further data analysis. Apart from the herbal dentifrice intervention, the conditions were different, as different types of manual toothbrushes were used, which might have led to additional differences in all the study outcomes. Slot et al. have shown that depending on the toothbrush type used, effect of mechanical tooth brushing can be diverse. In two studies,, gum massage was done by gel application, and Amoian used dental floss in addition to toothbrushing. In addition, the results might have been influenced by oral hygiene instructions given differently to each group.,, At baseline, oral prophylaxis was performed before introducing the intervention into the oral cavity. An implication drawn was that at the start of the studies, the test and control groups included were commensurate. Therefore, heterogeneity observed at the end of the study reflected different behaviors of the study populations to the intervention group and the general reduction of all clinical parameters could be partly attributed to initial oral prophylaxis. We cannot solely conclude that the product investigated is beneficial in reducing plaque and gingivitis. Different formulations of test and control group have different active agents which may have different levels of efficacy and would have affected intervention effects. Heterogeneity can be explained by the presence of bias in 10 included studies, out of which 6 studies had low of risk of bias. All domains showed high risk of bias across the studies except for selective reporting which showed low risk of bias. The reader should exercise caution since the results of different studies can be inconclusive with high I2 values. This study found that the CI of each of the individual studies did not overlap; hence, this variability can be attributed to the uncertainty around each study point estimate there were inconsistencies in the individual study estimates which has wide variations of their intervals. The objective was to estimate the efficacy of removal of dental plaque following use of the herbal as compared to conventional toothpaste. However, outcome assessment of the gingivitis is a surrogate measure for efficacy leading to indirectness. Varied indices were used for dental plaque and gingivitis. Based on this systematic review, whether the indices analyzed are sensitive enough cannot be determined; however, all of them are commonly used in dentistry. Most commonly used indices in this review are Turesky's modification of Quigley and Hein PI, and Gingival index by Loe and Silness., The clinical investigation of the included studies was performed either at a university setting, school, or a dental clinic. Although this was insufficient data to assess the introduction of a bias, most of the studies did not provide any information on sample size calculation. Hawthorne effect plays a role in evaluating randomized clinical studies. The behavioral perspective of the patient is likely to be modified depending on their participation in a research project. Although in the two long-term studies, the Hawthorne effect may have diminished. CHX used as a positive control for 6 months introduces a chance of the study bias. As staining is a well-known drawback of CHX, in the two long-term studies, it would have been nearly impossible to not identify the CHX group, and thus, could have compromised the blindness of the study examiner. In the review, three studies,, were conducted for a duration of 15–21 days and such studies were used to assess short-term anti-plaque and anti-gingivitis effects. For the purpose of seal of acceptance, long-term studies are stipulated to have a duration of ≥6 months with a 3-month intermediate evaluation to establish the efficacy and safety of chemical agents and compliance of the patient, as specified by Americans with Disabilities Act. Only two studies, fulfilled the above criteria and hence subgroup analysis was performed considering long and short effects of the dentifrice. However, subgroup analysis showed the high presence of unexplained heterogeneity. Consideration to the compliance of the underlying protocols, as an important factor should be given in the study outcomes. Compliance was evaluated in only few studies.,, Although in these studies, the usage of dentifrices was supervised by evaluating the returned tubes, there was no mention about any outcomes related compliance. In a study by Chawla, by monitoring at certain time intervals, the principal investigator randomly controlled the compliance. Since the risk of bias was found to be high and the quality of evidence was found to be low, the estimates favored neither the herbal nor conventional dentifrices. Therefore, herbal dentifrices need to be used cautiously in promoting oral hygiene. A few herbal companies denied sharing internal report due to the proprietary nature of the products tested for commercial reasons. The nonresponse of several authors made it difficult to assess the reasons for the established risk of bias and we could not perform meta-regression to explore the reasons for heterogeneity. Further long-term randomized studies of >6 months are needed to investigate the beneficial effects of intervention alone. Future research should be based on extension of CONSORT statement to RCTs of herbal medicine interventions. Drawn conclusions from these results suggest that there exists no high-quality evidence to support or contradict the anti-plaque and anti-gingivitis effects of herbal dentifrice. Furthermore, studies were clinically heterogeneous which confined the study comparison and generalizability. Newman MG, Takei HH, Klokkevold PR. Carranza's Clinical Periodontology. 10th ed. New Delhi: Elsevier; 2006. Ganavadiya R, Shekar BR, Goel P, Hongal SG, Jain M, Gupta R, et al. Comparison of anti-plaque efficacy between a low and high cost dentifrice: A short term randomized double-blind trial. Eur J Dent 2014;8:381-8. Barnes VM, Richter R, DeVizio W. Comparison of the short-term antiplaque/antibacterial efficacy of two commercial dentifrices. J Clin Dent 2010;21:101-4. Frandsen A. Mechanical oral hygiene practices: State-of-the science review. In: Loe H, Kleinman DV, editors. Dental Plaque Control Measures and Oral Hygiene Practices. Oxford: IRL Press; 1986. p. 93-116. Mandel ID. Chemotherapeutic agents for controlling plaque and gingivitis. J Clin Periodontol 1988;15:488-98. George J, Hegde S, Rajesh KS, Kumar A. The efficacy of a herbal-based toothpaste in the control of plaque and gingivitis: A clinico-biochemical study. Indian J Dent Res 2009;20:480-2. Pannuti CM, Mattos JP, Ranoya PN, Jesus AM, Lotufo RF, Romito GA, et al. Clinical effect of a herbal dentifrice on the control of plaque and gingivitis: A double-blind study. Pesqui Odontol Bras 2003;17:314-8. Olabinri BM, Adebisi JA, Odesomi OF, Olabinri PF, Adeleke GE. Experimental classification of the antioxidant capacity of the leaf, stem and root barks of Mangifera Indica, Azadirachta Indica. Afr J Biotechnol 2009;8:2968-72. Herbal Toothpaste. Available from: https://consumeraffairs.nic.in/consumer/writereaddata/Herbal_Toothpastes_13.pdf. [Last accessed on 2017 Mar 29]. Hong CH, Wei TP. The efficacy of Chinese herbal based dentifrice on the control of plaque and gingivitis. J Periodontol 2002;73:1240-4. Dhingra K. Aloe vera herbal dentifrices for plaque and gingivitis control: A systematic review. Oral Dis 2014;20:254-67. Higgins JP, Green S, editors. Cochrane Handbook for Systematic Reviews of Interventions. Ver. 5.1.0. John Wiley & Sons: The Cochrane Collaboration; 2011. Available from: http://www.cochrane-handbook.org. [Last updated on 2017 Dec]. Gupta R, Ingle NV, Kaur N, Yadav P, Ingle E, Charania Z. Effectiveness of herbal and nonherbal fluoridated toothpaste on plaque and gingivitis: A randomized controlled trial. J Indian Assoc Public Health Dent 2015;13:218-21. Howshigan J, Perera K, Samita S, Rajapakse PS. The effects of an ayurvedic medicinal toothpaste on clinical, microbiological and oral hygiene parameters in patients with chronic gingivitis: A double-blind, randomised, placebo-controlled, parallel allocation clinical trial. Ceylon Med J 2015;60:126-32. Bhat N, Bapat S, Asawa K, Tak M, Chaturvedi P, Gupta VV, et al. The antiplaque efficacy of propolis-based herbal toothpaste: A crossover clinical study. J Nat Sci Biol Med 2015;6:364-8. Mitra D, Shah S, Shah R, Silvia R, Pathare P, Vijayakar H. Evaluation of the clinical efficacy of a herbal toothpaste in comparison with a triclosan containing toothpaste in a population of dental college students: A double-blind randomized controlled trial. Indian J Contemp Dent 2015;3:67-70. Tatikonda A, Debnath S, Chauhan VS, Chaurasia VR, Taranath M, Sharma AM, et al. Effects of herbal and non-herbal toothpastes on plaque and gingivitis: A clinical comparative study. J Int Soc Prev Community Dent 2014;4:S126-9. Pradeep AR, Agarwal E, Naik SB. Clinical and microbiologic effects of commercially available dentifrice containing Aloe vera: A randomized controlled clinical trial. J Periodontol 2012;83:797-804. AI-Kholani AI. 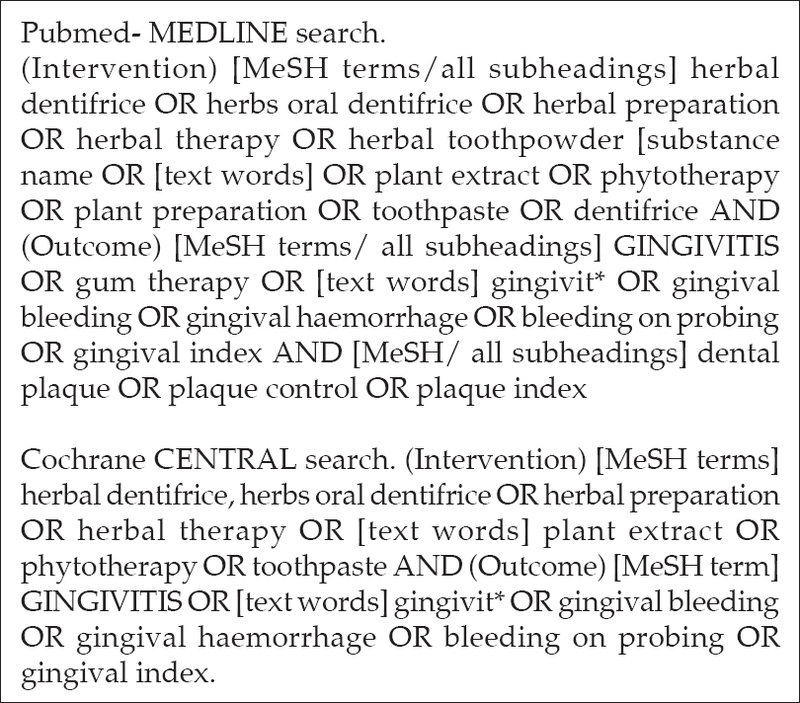 Comparison between the efficacy of herbal and conventional dentifrices on established gingivitis. Dent Res J (Isfahan) 2011;8:57-63. Srinivasa S, Nandlal B, Srilatha KT. A comparative evaluation of a commercially available herbal and non-herbal dentifrice on dental plaque and gingivitis in children: A residential school-based oral health programme. J Dent Oral Hyg 2011;3:109-13. Amoian B, Moghadamnia AA, Mazandarani M. The effect of calendula extract toothpaste on the plaque index and bleeding in ginagivitis. Res J Med Plant 2010;4:132-40.
de Oliveira SM, Torres TC, Pereira SL, Mota OM, Carlos MX. Effect of a dentifrice containing Aloe vera on plaque and gingivitis control. A double-blind clinical study in humans. J Appl Oral Sci 2008;16:293-6. Chawla R, Shetiya SH, Deepti A. Comparing the Efficacy of Gel Containing Aloe vera (25%) with Chlorhexidine Gluconate (1% W/W) in Treatment of Gingivitis Amongst Blind Children – A Triple Blind, Parallel Group, Placebo Controlled Randomized Control Trial [Dissertation]. India, Dr. D.Y. Patil Vidyapeeth; 2014. Pradeep AR, Agarwal E, Bajaj P, Naik SB, Shanbhag N, Uma SR, et al. Clinical and microbiologic effects of commercially available gel and powder containing Acacia arabica on gingivitis. Aust Dent J 2012;57:312-8. Jayashankar S, Panagoda GJ, Amaratunga EA, Perera K, Rajapakse PS. A randomised double-blind placebo-controlled study on the effects of a herbal toothpaste on gingival bleeding, oral hygiene and microbial variables. Ceylon Med J 2011;56:5-9. Arweiler NB, Pergola G, Kuenz J, Hellwig E, Sculean A, Auschill TM, et al. Clinical and antibacterial effect of an anti-inflammatory toothpaste formulation with Scutellaria baicalensis extract on experimental gingivitis. Clin Oral Investig 2011;15:909-13. Radafshar G, Mahboob F, Kazemnejad E. A study to assess the plaque inhibitory action of herbal-based toothpaste: A double blind controlled clinical trial. J Med Plants Res 2010;4:1182-6. Rodrigues IS, Tavares VN, Pereira SL, Costa FN. Antiplaque and antigingivitis effect of lippia sidoides: A double-blind clinical study in humans. J Appl Oral Sci 2009;17:404-7. Salgado AD, Maia JL, Pereira SL, de Lemos TL, Mota OM. Antiplaque and antigingivitis effects of a gel containing Punica granatum Linn extract: A double-blind clinical study in humans. J Appl Oral Sci 2006;14:162-6. Adámková H, Vicar J, Palasová J, Ulrichová J, Simánek V. Macleya cordata and Prunella vulgaris in oral hygiene products – Their efficacy in the control of gingivitis. Biomed Pap Med Fac Univ Palacky Olomouc Czech Repub 2004;148:103-5. Quigley GA, Hein JW. Comparative cleansing efficiency of manual and power brushing. J Am Dent Assoc 1962;65:26-9. Podshadley AG, Haley JV. A method for evaluating oral hygiene performance. Public Health Rep 1968;83:259-64. Loe H, Silness J. Periodontal disease in pregnancy. I. Prevalance and severity. Acta Odontol Scand 1963;21:533-51. Carter HG, Barnes GP. The gingival bleeding index. J Periodontol 1974;45:801-5. Guyatt GH, Oxman AD, Vist GE, Kunz R, Falck-Ytter Y, Alonso-Coello P, et al. Grade: An emerging consensus on rating quality of evidence and strength of recommendations. BMJ 2008;336:924-6. Hioe KP, van der Weijden GA. The effectiveness of self-performed mechanical plaque control with triclosan containing dentifrices. Int J Dent Hyg 2005;3:192-204. Paraskevas S, van der Weijden GA. A review of the effects of stannous fluoride on gingivitis. J Clin Periodontol 2006;33:1-3. Sälzer S, Slot DE, Dörfer CE, Van der Weijden GA. 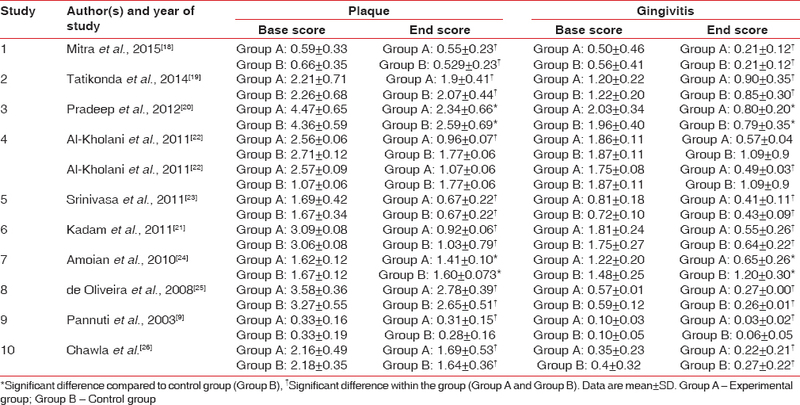 Comparison of triclosan and stannous fluoride dentifrices on parameters of gingival inflammation and plaque scores: A systematic review and meta-analysis. Int J Dent Hyg 2015;13:1-7. Demarco FF, Meireles SS, Masotti AS. Over-the-counter whitening agents: A concise review. Braz Oral Res 2009;23 Suppl 1:64-70. Slot DE, Wiggelinkhuizen L, Rosema NA, Van der Weijden GA. The efficacy of manual toothbrushes following a brushing exercise: A systematic review. Int J Dent Hyg 2012;10:187-97. American Dental Association Acceptance Program Guidelines Chemotherapeutic Products for Control of Gingivitis; July, 2008. Available from: http://www.ada.org/sections/scienceAndResearch/pdfs/guide_chemo_ging.pdf. [Last accessed on 2016 Dec 12].